The Hubble Space Telscope captures aftermath of asteroid collision in this series of photos taken between January and May 2010. The images show the object P/2010 A2, an X-shaped objected created by two colliding asteroids. An odd asteroid's peculiar tail is far longer than previously thought, stretching nearly three times the distance from Earth to the moon, scientists say. 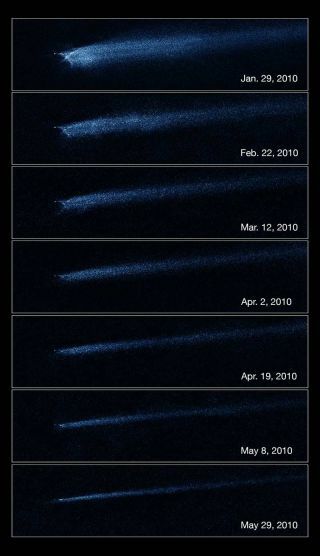 The surprising tail of dust streaming from the asteroid P/2010 A2 is about 620,000 miles (1 million kilometers) long, new photos taken by the One Degree Imager (ODI) camera at the WIYN telescope in Arizona reveal. "Previous images of A2 clearly indicated the tail extended beyond those relatively small fields of view; we wanted to use the superb image quality over a wide field that ODI offers to see just how much," Jayadev Rajagopal, WIYN scientist at the National Optical Astronomy Observatory in Tucson, Ariz., said in a statement. "But I don't think we were quite expecting to see a tail that extends out to and beyond even the ODI field!" Asteroid P/2010 A2's long tail stretches nearly three times the distance from the Earth to the moon, images from the WIYN telescope in Arizona reveal. It's rare to see an asteroid with a tail — only a dozen such objects are known, Rajagopal said — and astronomers initially thought P/2010 A2 was a comet upon its discovery in 2010. But the picture became clearer after NASA's iconic Hubble Space Telescope photographed the object a month or so after it was first spotted circling the sun in the main asteroid belt between Mars and Jupiter. The Hubble observations led astronomers to estimate that an asteroid 10 to 16 feet (3 to 5 meters) wide may have slammed into P/2010 A2's core, which is about 390 feet (120 meters) wide. This cosmic smashup was likely as powerful as an atomic bomb, vaporizing the smaller space rock and stripping material from P/2010 A2. Sunlight and the stream of charged particles from the sun known as the solar wind then swept these dusty bits into a tail, the theory goes. Over time, the centimeter-size particles in P/2010 A2's tail will form a meteor stream around the sun, as happens with debris shed by comets, scientists said. Earth will eventually plow through this spreading stream, causing meteors visible from the planet's surface — but not for another million years or so. Asteroid collisions and other debris-spewing events add to a cloud of dust spread around our solar system. The new images from the ODI camera will shed light on how much material asteroids contribute to this "zodiacal dust," researchers said.